Among the many talents Maggie Stiefvater has, the one I believe she excels at the most, is how she captures the setting in her novels. She has this uncanny ability of making the reader experience all five of their senses, as they pour through her books - and THE RAVEN BOYS did not disappoint. She also draws such animated characters, each one having a reason to be included. And I thoroughly enjoyed the various POV's she told the story through - something we're used to seeing from Stiefvater. I was fascinated by the premise of the book around the ley lines and the quest the boys are on. And I was particularly absorbed in Blue's story - what a strange upbringing, what with her clairvoyant family - which was written in way that makes it seem so normal. And then there's the twist - oh, the twist! I wasn't expecting that at all - and it's well worth reading this one to find out what it is, I promise. I have been a long time fan of Maggie's books - from how vivid she wrote the scene in the candy shop, in SHIVER, to how nom-tastic the November Cakes seemed in THE SCORPIO RACES - and I'm for sure on board to take the journey with THE RAVEN BOYS, wherever they'll go next. The YA Book Club is hosted by the greatness that is Tracey Neithercott, from over at Words On Paper. For the month of October, readers selected The Raven Boys by Maggie Stiefvater, as this month's read. And the more, the merrier! 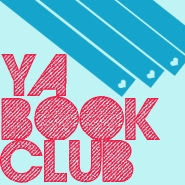 If you'd like to partake in reviewing this month's selection - or jumping on board in the future - you can find all the details here: YA Book Club.